The patterns that are shown in the book are all Model-View-Controller (MVC), the popular design pattern being used in a lot of back-end frameworks such as Ruby on Rails, ASP.NET MVC and CodeIgniter (PHP) to name a few. Traditional web applications require a lot of requests to the server, but using MVC on the Frontend you can create One-Page-Applications with all the logic in the frontend. 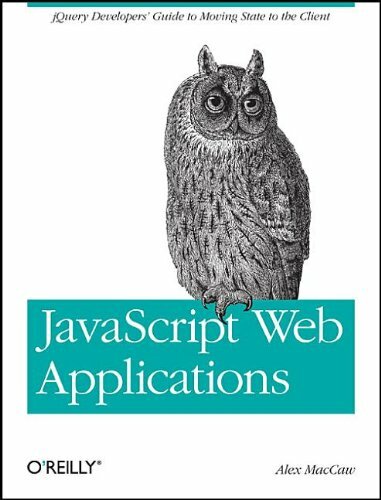 This might sound crazy at first, but after reading the book and trying it out for myself, I’m confident that this is a good approach for certain kinds of web applications. It’s actually more like programming Desktop Applications. This approach gives you applications that responds immediately on user interaction. Because it doesn’t have to perform constant server requests, it is snappy and responsive. Check out Backbone.js Introduction and Resources to learn more. Note: I wrote this review for O’Reilly’s Blogger Review Program. Their deal is pretty good: You get a free e-book to read and once you post a review you get another. Try it yourself if you’re interested in reviewing books.